Chikankata Mission Hospital caters a catchment population of over 100,000 people, nearly all living in remote areas of the Southern Province of Zambia. The origin of our HIV/AIDS programme in March 1987 was preceded by the diagnosis of a skin condition, Kaposi’s sarcoma, in a patient in 1986, with another 37 more cases of AIDS diagnosed later at the end of that year. As more cases of AIDS crowded the hospital wards, the idea to build a hospice was debated by the hospital staff and the community leaders and finally rejected. It was felt that the numbers of patients who would require care would soon overwhelm a hospice. Knowing that caring of the sick by families at home is an inherent strength of Zambian society, a home based care approach of people living with HIV/AIDS (PLWHA) was adopted. The system involved the family, neighbourhood and community with Chikankata Health Services as a key player. This approach has been encouraged and adopted by the Hospital up to this time due to the positive impact it has had on our community. 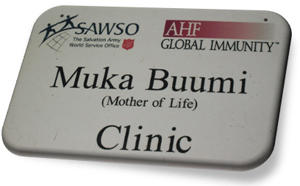 The Muuka Buumi Clinic opened its doors on the 1st of September 2004. It serves to treat those who are infected with HIV/AIDS by offering treatment that improves and prolongs their quality of life. This project is sponsored by AIDS Healthcare Foundation, Centre for Infection Diseases Research in Zambia C.I.D.R.Z and the Salvation Army World Service Office. The Government of The Republic Of Zambia through the Ministry of Health also plays a role by providing Clinical and Nursing staff as well as some drugs. Mrs. Pilingana is the Sister in charge of the Clinic. Currently there are a total of 5213 clients enrolled on HIV care as from the time the clinic started. These included both non-ART and ART clients while of this total, 2732 clients are on ART care. Of the 2732 clients on ART there are a total of 103 boys (age range of 0-14 years), 110 girls (age range of 0-14 years), 958 adult males and 1561 adult females. The clinic is open from Monday to Friday and is also opened for a day for pediatric patients during the week. The Clinic has also decentralised the ART clinics through the Doctor’s monthly visits to nine (9) Rural Health Centres surrounding Chikankata Mission Hospital because some patients had to walk for days to reach our hospital and this has resulted in increased accessibility and home based care.